This is an individualized sheet made for students who have trouble staying on task. This is a simple to do list that can be used for any assignment within the classroom or for home. Student Self-Monitoring of Behaviors Checklist for SPED, Gen Ed, Psychs, Bx! 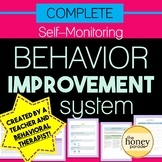 Self-Monitoring Behavior Improvement System - for ANY behavior problems! This can be easily modifeied to fit your student's classes and areas of concerns. This is what I have used with my students who were capable of monitoring their own behavior throughout the day. This is a perfect activity for students who have behavioral / social objectives. This is a checklist that children can use to monitor their behavior during each activity of the day. It can be sent home so their parents know how they did that day. This is a checklist made so that students are responsible for keeping track of how many times they are redirected for a problem behavior. This is customizable and can be adapted for a specific behavior. Self Monitoring Checklist - All Ages! Use a research-based tool to have students self-monitor their behavior. 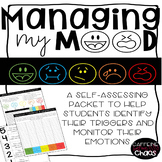 Students who have the autonomy to independently utilize a self-monitoring checklist can promote positive behavioral change. This tool can be used for data collection purposes. A simple checklist to help a student stay on task while working within a group. This is a self-monitoring checklist for the student to complete, complete with an area of reflection if the student is not able to obtain all checks.